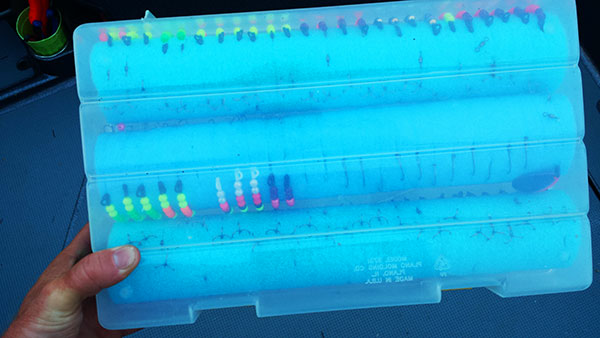 Simple fishing life-hack will save time and prevent a huge mess in the bottom of your boat. Over the years I have changed and refined the way I store my gear to be more efficient. Slim plastic tackle boxes allow you to see both the front and back of the spinner blades. This is very crucial since so many of the popular colors are available in countless back colors. This tight fit also keeps them from sliding around. If you want to take it one step further you can keep the blades in small plastic baggies inside the boxes to help keep the finish from dulling or chipping. My buddy Joe Okada uses a similar system to what I do for carrying extra bead rigs. This will keep you from dealing with a huge mess of loose beads in hard-to-reach spots in your boat.